A blended Scotch Whisky from James Eadie bottled in 2017. Classic blended-spicy character and some hay at first on the nose. A bit rough and youngish. Lot of white fruits like sweet pears and apples. The taste took me a bit by surprise. A bit more flavourful, and some smoke and dirt appear. 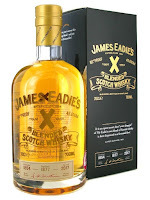 Some sweetness – especially vanilla – comes rushing in after the smoke settles, in the finish, alongside the white fruits. I’m glad that it at least is bottled at 45,6%, which gives it some extra flavours. It would simply have been to week at 40%. Thanks for that! And actually this just gets better and better, minute after minute. So give it some time, let it breath and enjoy sip by sip. I will give this 81/100 (19/20/21/21).